Tacoma, WA 98402. Just about the time we thought everyone had made it, another showed up! And to his credit, our wait person took it all in stride! My only complaint about the restaurant is that so much of the menu looked so good. And judging by our group of 13, it was all as good as it sounded! For me this is a once in a while kind of treat, but it was a great way to kick off the summer season (even though it was too chilly to sit on the deck!). 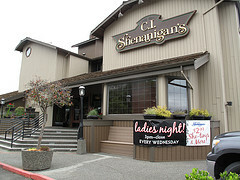 Shenanigan’s has been around since 1983 and there are two other locations, one in Spokane and the other in Boise, ID. 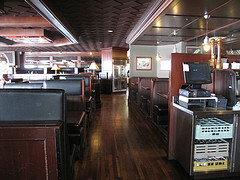 This entry was posted in Sit Down Establishments, Tacoma, WA State - Pierce County and tagged restaurant, Shenanigans, Tacoma, waterfront on June 22, 2011 by admin.